On the Internet we found someone who was selling a new American-style toilet. Exactly what we needed for the Wanderlodge. So we drove to the Ahaus area to pick up this toilet. 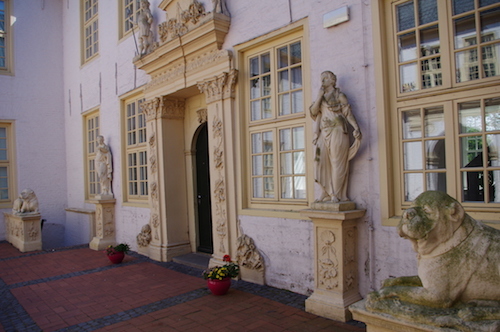 And once we were there, we had a look at the Ahaus castle. 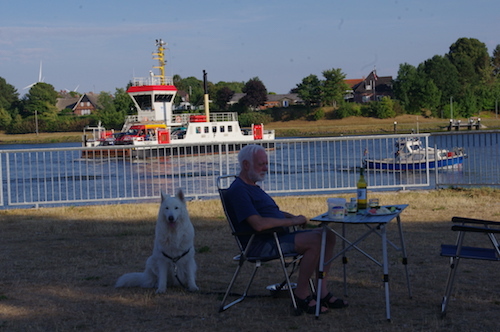 A short trip to Emden to meet our friend Elisabeth and her mother. 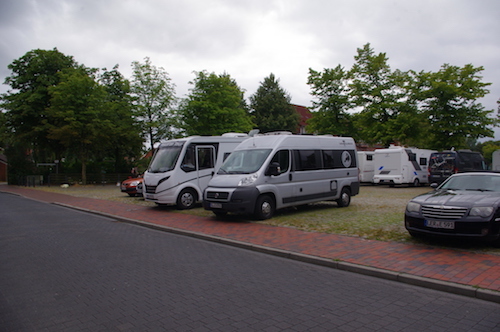 The first night we sleep on the official municipal motorhome parking, which is close to the Emden marina. 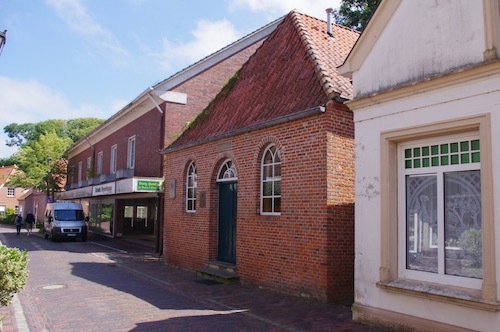 With Elisabeth we explore traces of Jewish life in Emden. 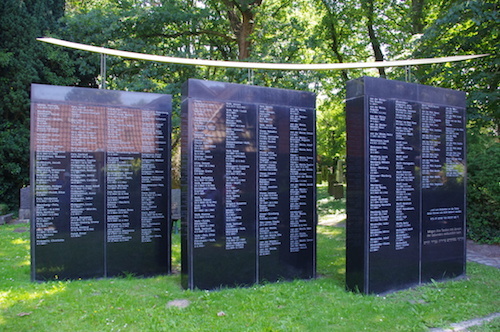 This monument lists all Jews from Emden who perished in the Shoa. 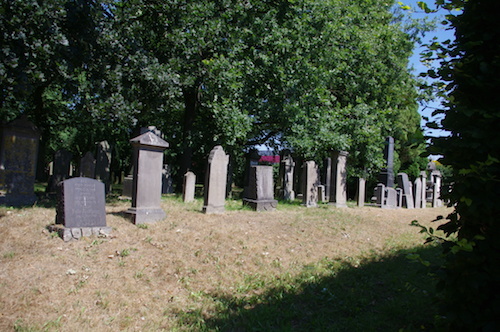 This cemetery survived the war without significant damage. 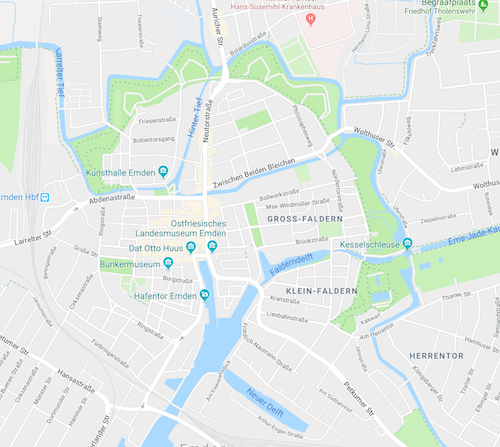 Emden is a fortified city with strongholds and canals. 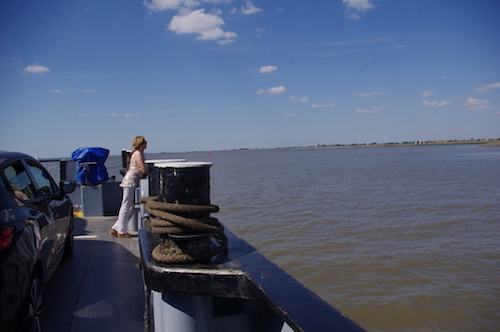 Elisabeth takes us on a boat trip to show us the most beautiful corners of these waterways. 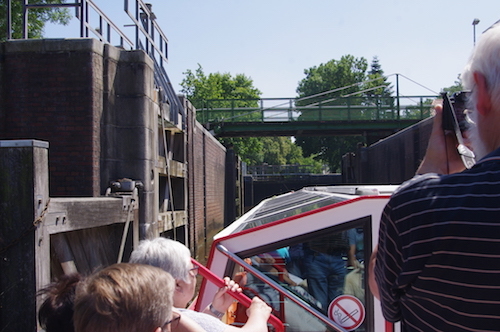 Where the city canal crosses one of the large waterways, are impressive locks. 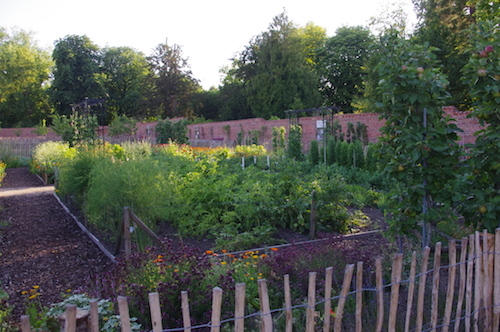 We also sail past the garden of Elisabeth's mother. 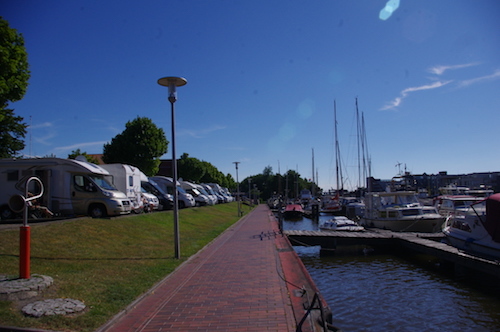 And via the seaport we arrive in the old harbour, the destination of the cruise. 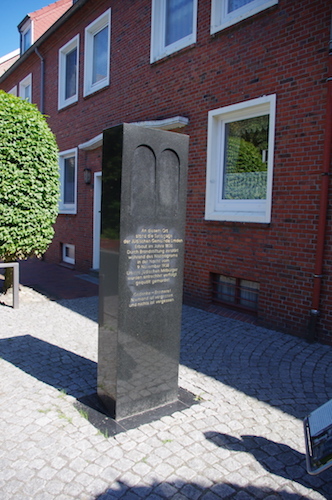 Memorial column where the synagogue once stood. 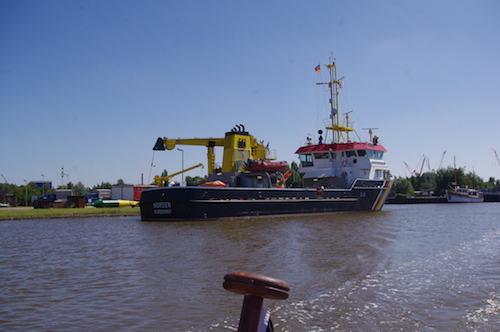 A week later we take off to the same region, East Frisia. Here we are in Leer. 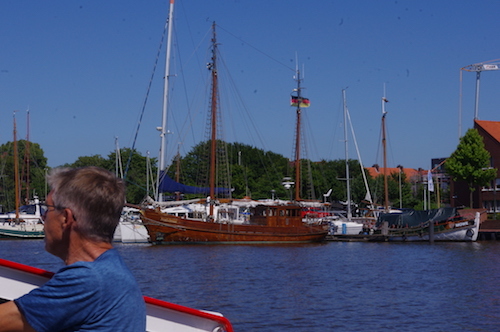 ... and a very attractive historic harbour. This tasty bronze lady swims in stereo! 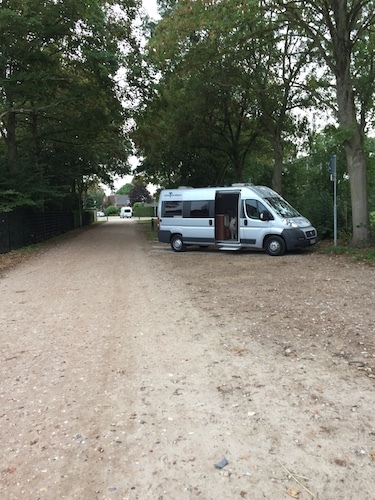 A very quiet place for the night in Marienhafe, only an hour north of Leer. 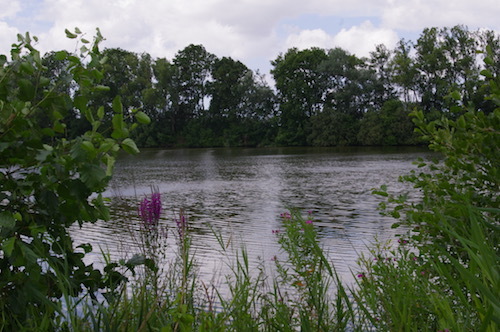 A stone's throw away is the village park with a beautiful pond (and countless geese and their droppings). 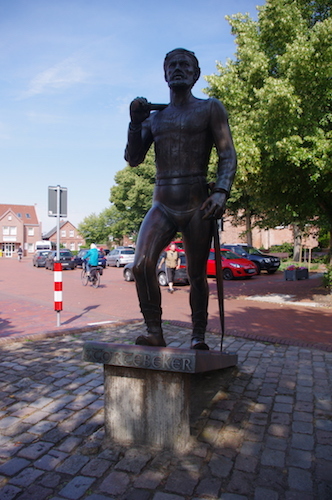 ... with the statue of Germany's most famous pirate, Klaus Störtebeker. 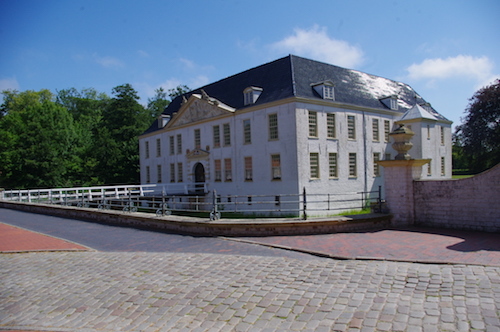 On our way to the sea we unexpectedly find this castle in Pewsum. 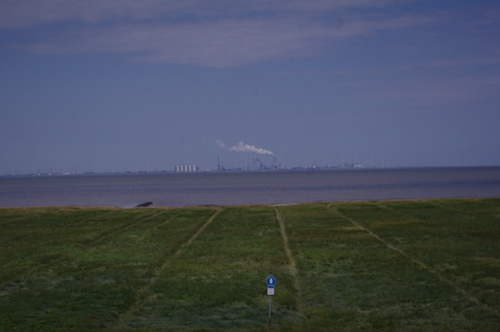 Krummhörn on the western coast of East Frisia. The sea dike is forbidden for dogs, so no walk as we had planned. 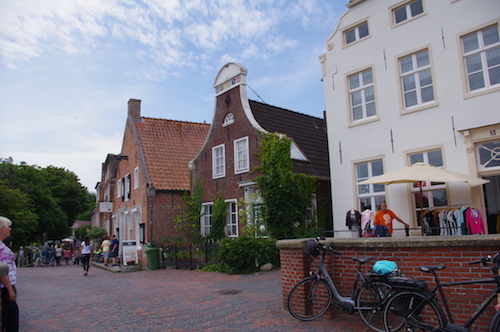 On to a nice tourist spot, nearby Greetsiel. 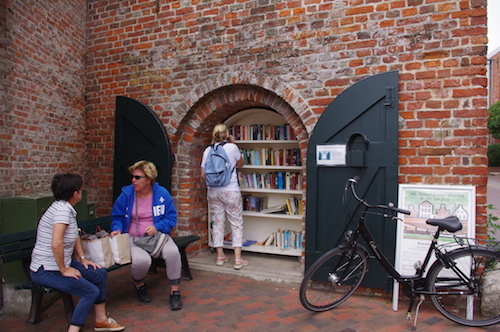 ... and a place to find second-hand books for one Euro each. 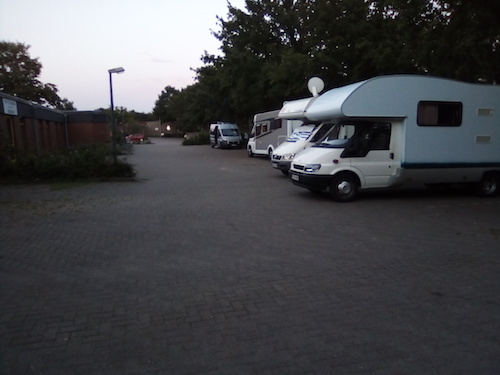 The last night is spent at the camper spot in Großheide, where we are all alone. 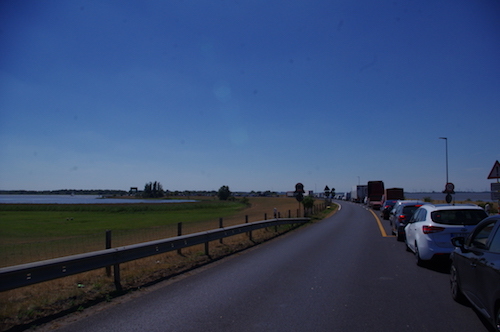 Behind the van is a nice lake with a beach. Again, forbidden for dogs though we do see a few. Dornum is not far from the northern coast. 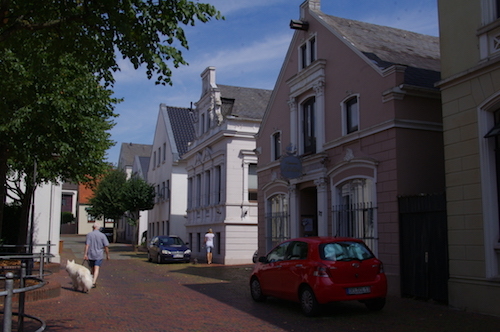 This is the old synagogue. 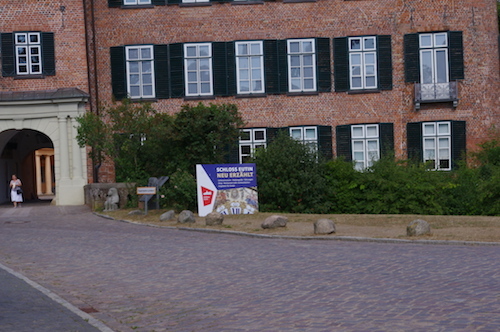 Now a museum but not open today. Another unexpected castle. 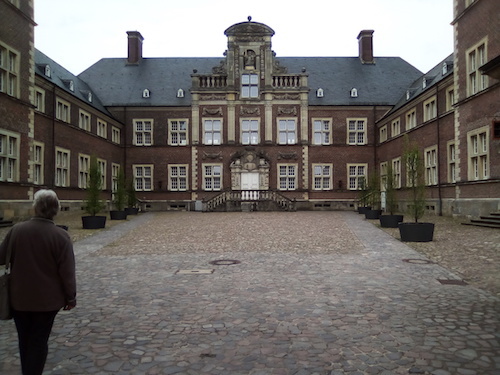 Now used as a school and because of the school holiday we are invited to have a look at the courtyard which is normally closed to outsiders. 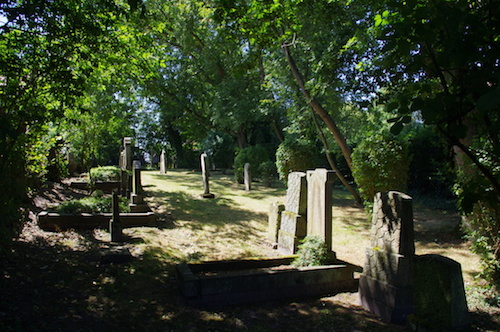 The Jewish cemetery in Dornum. 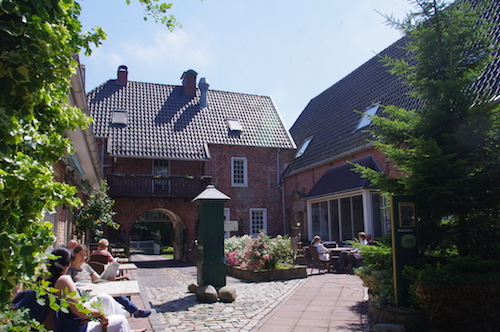 We have a drink in the courtyard of the medieval castle Beningaburg, now in use as a hotel-restaurant. 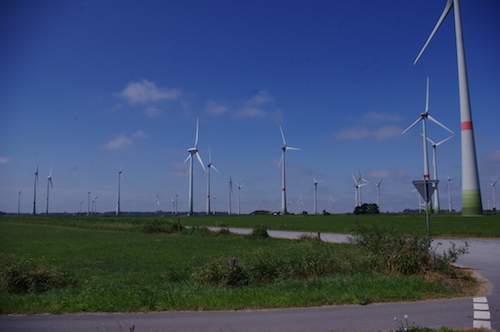 The landscape shows a huge amount of windmills. No wonder, because there's nearly always a strong wind here. 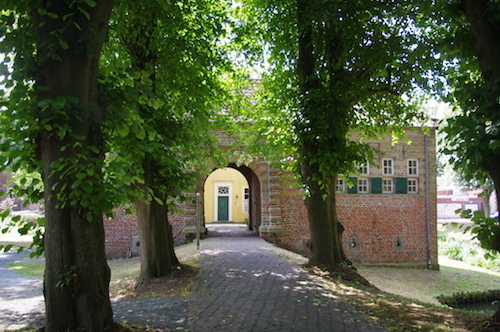 In Aurich the Jewish cemetery is closed, but one can have a peep through the gate. After two weeks at home, we take another short trip. 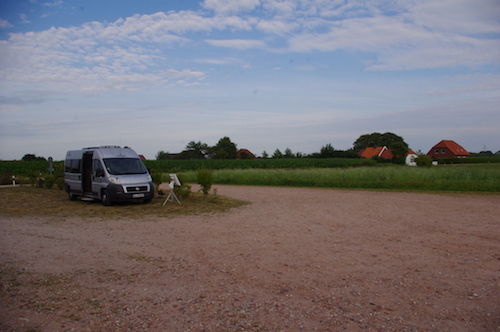 First night we stay in Ottersberg near Bremen. 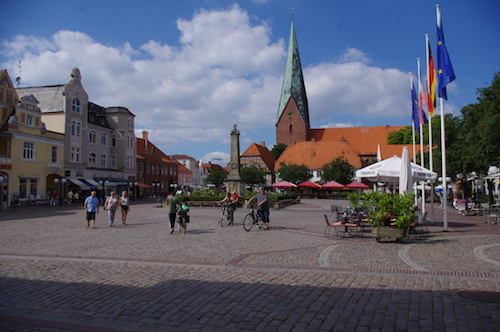 Next day we drive on to Eutin in Schleswig-Holstein. 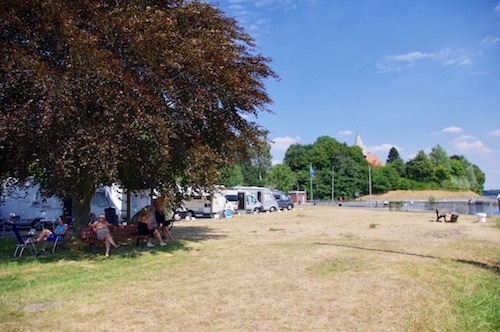 The free camperspot is opposite the station and near the centre of this nice town. 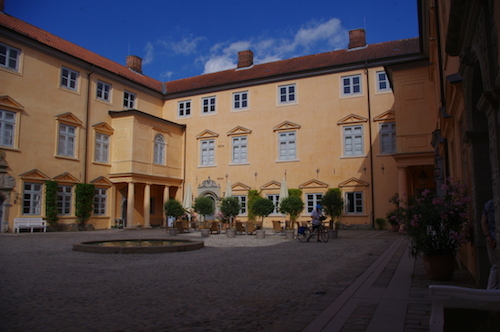 ... the castle, situated in a beautiful park. To our surprise we see a poster with the announcement that the Israeli author Meir Shalev will give a presentation here tonight. After a quick Turkish dinner in town we head back to the park. 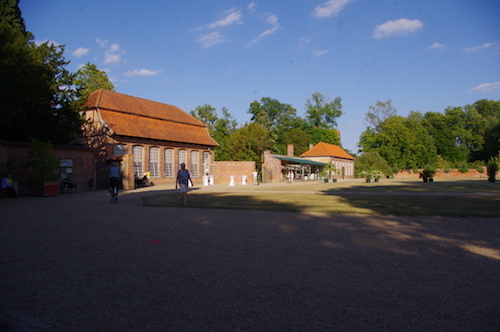 ... the Orangerie. Here Meir Shalev will give his speech tonight. 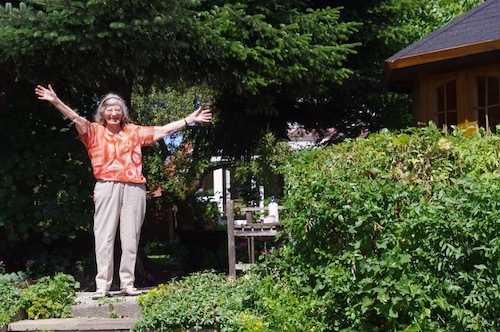 He'll present the German translation of his latest book My Wild Garden. Motek would have been allowed in as well as long as he would keep quiet. 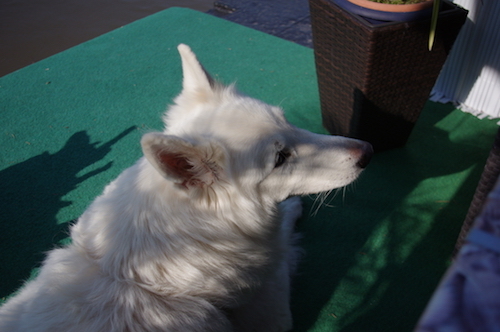 Knowing him, we expect him to get bored and so we decide that Ernst will go in, while Sylvia will take Motek for a walk in the park. It is a warm summer evening, so no problem there. 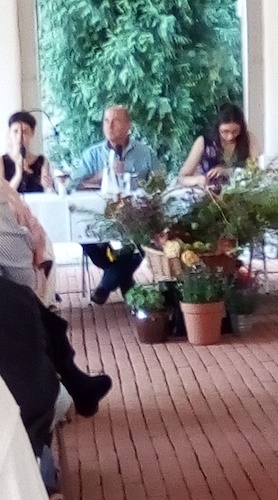 Shalev with his interpreter, the president of the organising committee and the German artist who reads parts of the translated text. 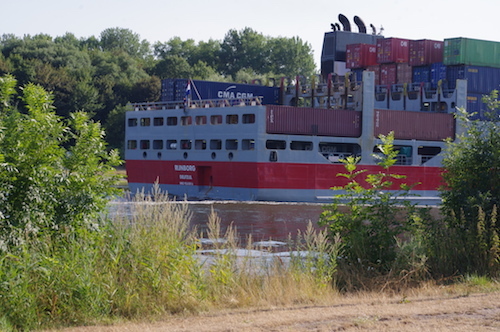 An hour to the northwest is Sehestedt at the Kiel canal (North Sea - Baltic Sea). 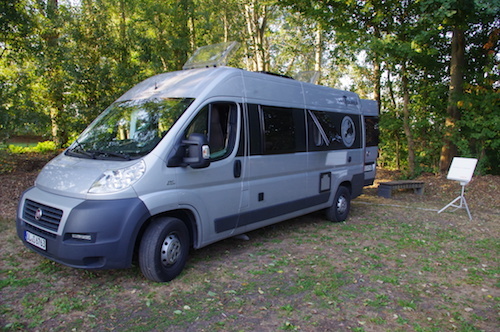 For motorhomers a sought-after spot. 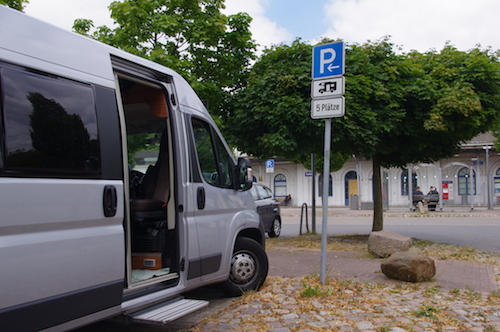 We had the very last parking place. It is so hot that everybody looks for a little shade. ... and some really big ones. 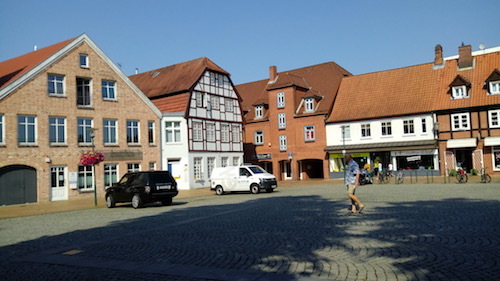 ... Ernst goes to see the (very nice) dentist in the black and white half-timbered house on the corner. The dentist takes an X-Ray and prescribes some antibiotics, which we fetch at a nearby pharmacy. 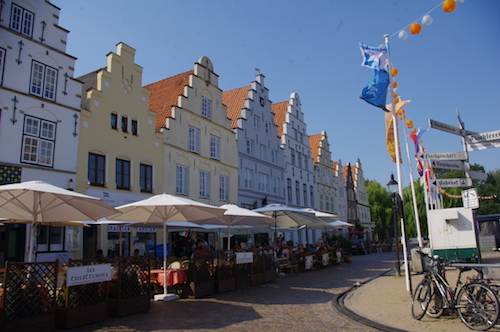 Then on to Friedrichstadt, the 'Dutch' town. 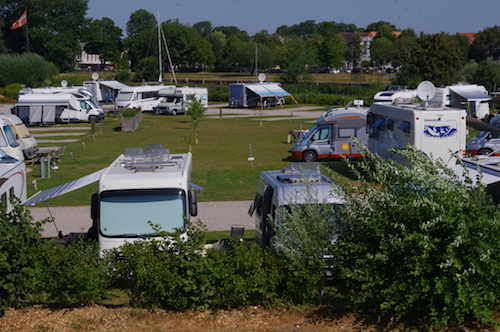 We can have a spot for one night, because for the weekend all pitches are reserved. It turns out there will be a festival in town. 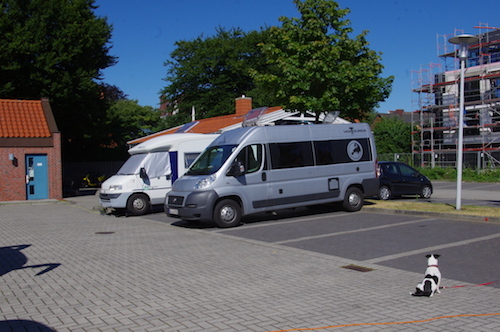 We leave the van on the motorhome site and walk to the town centre, which is not far. 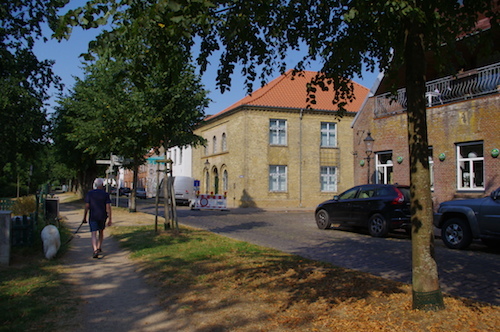 The yellow building is the former synagogue. 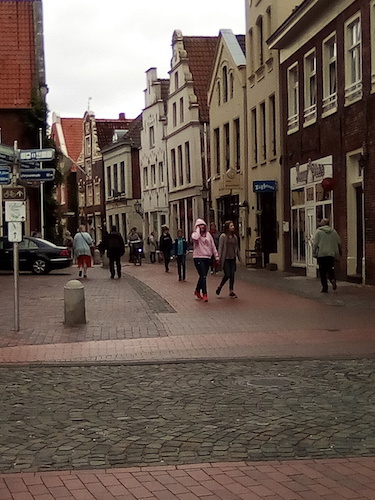 Indeed the town looks very Dutch. 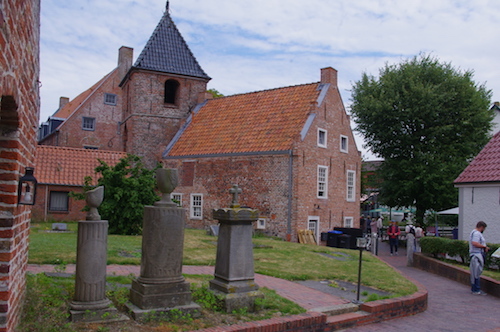 The market square with Dutch gables, all decorated for tomorrow's festival. 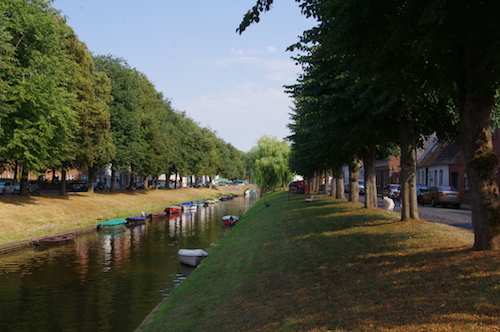 Even the surrounding landscape looks Dutch. 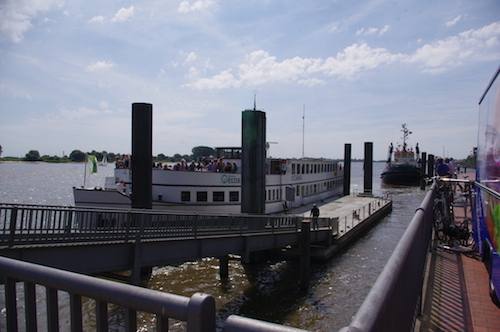 In order to avoid the road works in Hamburg, we decide to take the ferry in Glückstadt. It turns out that we are not the only ones. Delays up to 90 minutes after we have already waited some time. 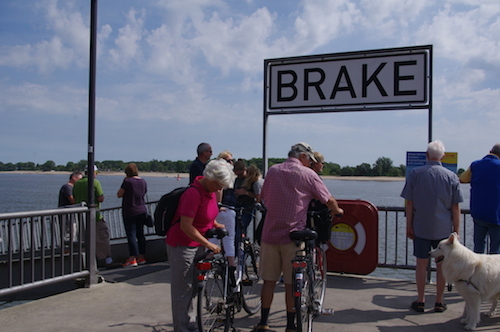 Queue for the Elbe ferry in Glückstadt. All in all, it took us two hours. Fortunately, we are on holiday and not on the run! 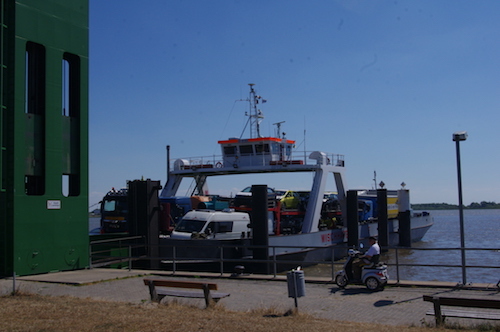 At last: our ferry arrives! 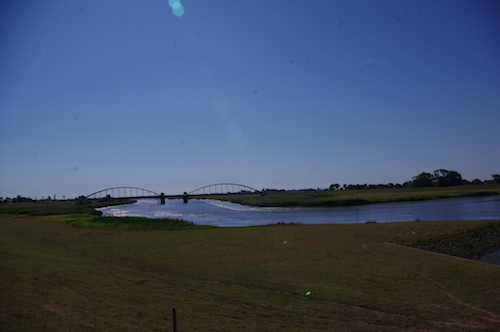 Crossing the Elbe, not a childish little river. 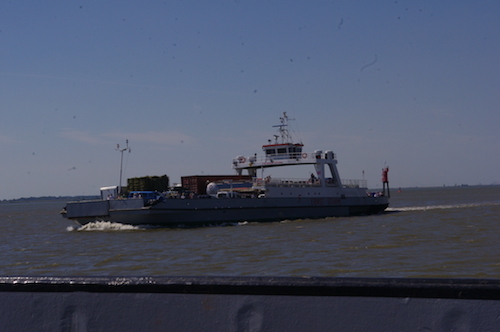 Ferry coming from the opposite shore. 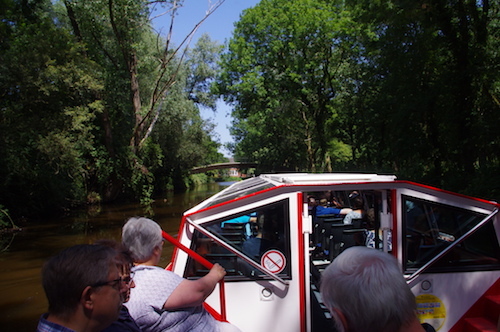 Our next destination is familiar to us: Oberndorf at the river Oste. Seven years ago we've been here to look at a former hotel. We decided not to buy it because of the questionable condition. 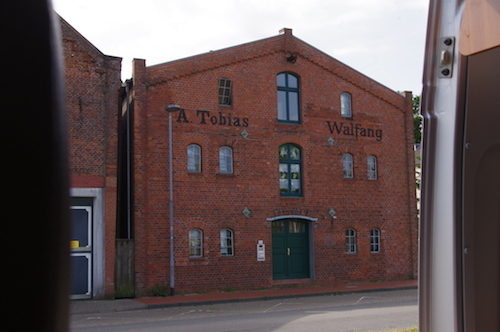 Now we find out it has been demolished. Apparently we made the right decision. 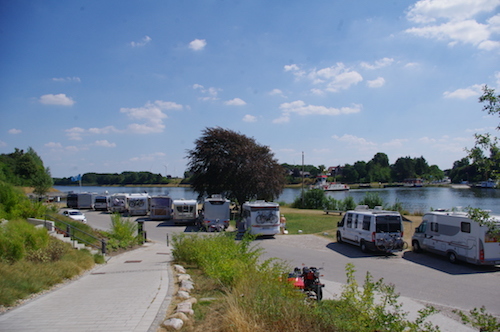 For motorhomes there is a quiet spot just outside the village. The previous time it was free; now we are asked to take an envelope, put 5 Euro inside and bring it to a letterbox at a house nearby. No problem! The place is well taken care off. We can use our new automatic satellite dish and watch some TV in the evening. 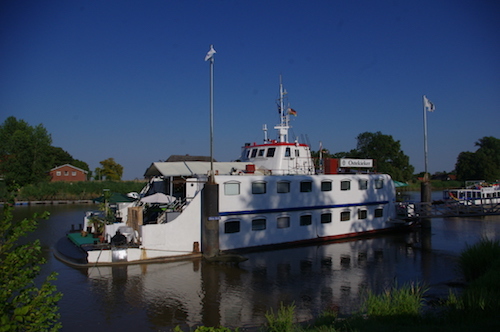 But first we have an early dinner at this former ferry ship in the river Oste. We remember the restaurant from our previous visit. 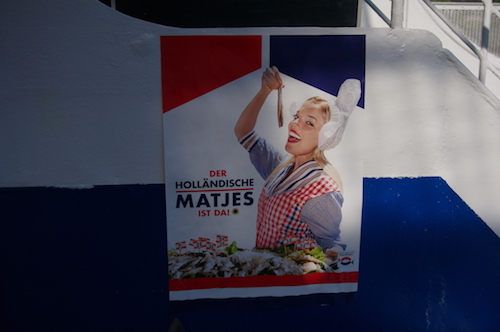 To our surprise they have very tasty herring (and tasty ice cream as dessert). Motek waits more or less patiently till we are finished. The last night of this trip we stay at Stadtland Seefeld. 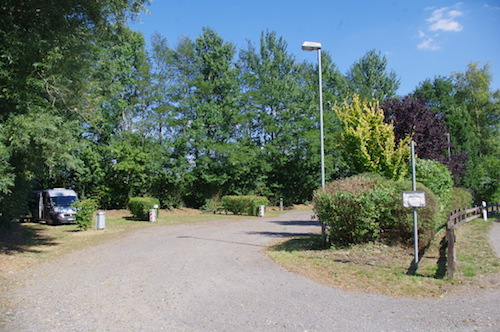 A free spot (with paid electricity) next to sports fields and a club house. Unfortunately at 6 PM a birthday party starts nearby. Last guests leave around 2 PM and they are not exactly quiet. 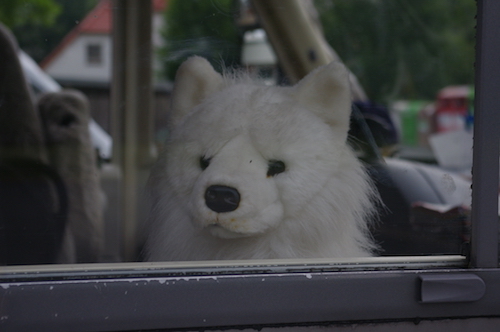 Our neighbours also have a white dog in their motorhome. 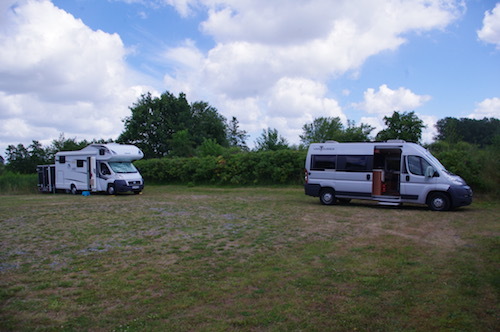 On the way home we stop at the motorhome site in Brake. Here we can legally dispose of our litter, alway good in the still very hot weather. 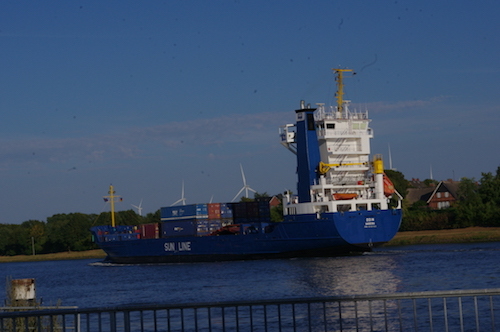 View of the harbour. 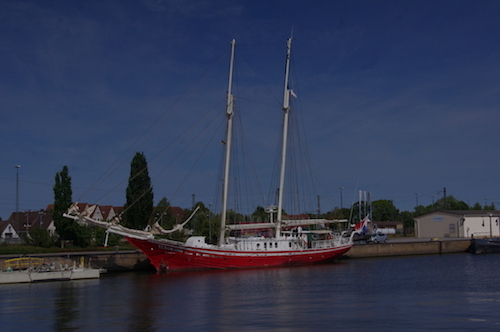 Across from where we stand lies the 125' Dutch schooner Eldorado. 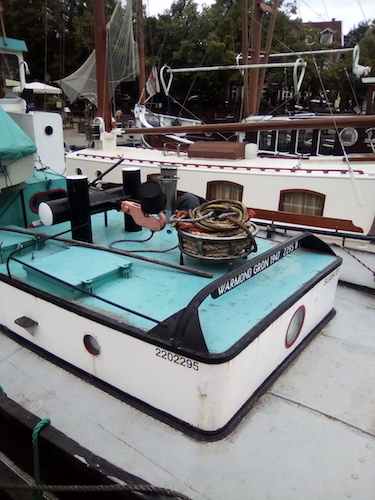 Some ship owners from Brake have earned their money in whaling. 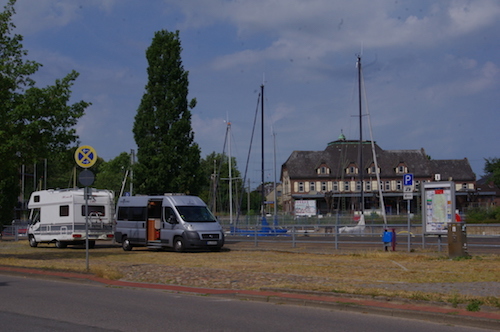 People are waiting for a boat trip to a nearby island with a beach. 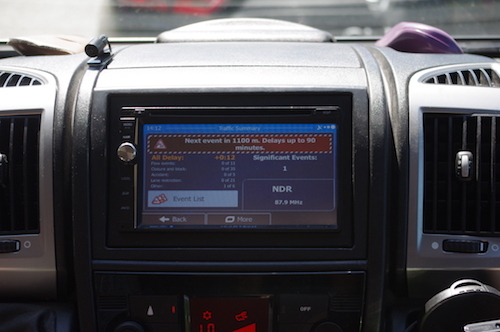 From Brake we drive home. 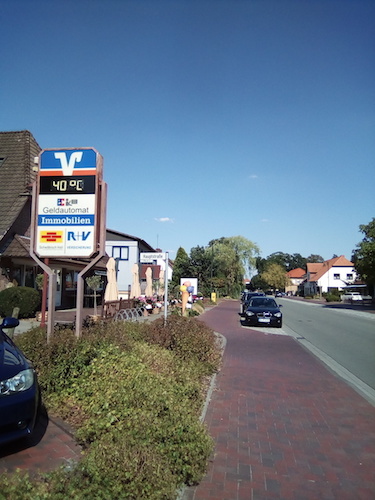 The Summer of 2018 knew many hot days, some even as hot as 40℃ (104℉)! 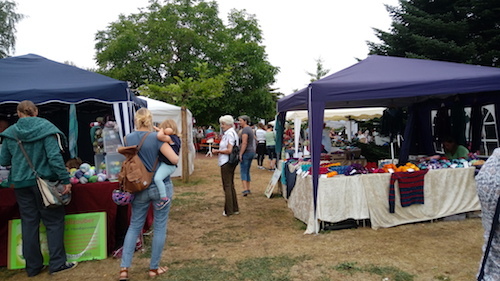 We visited the wool festival in Sulingen for the fourth time this year. 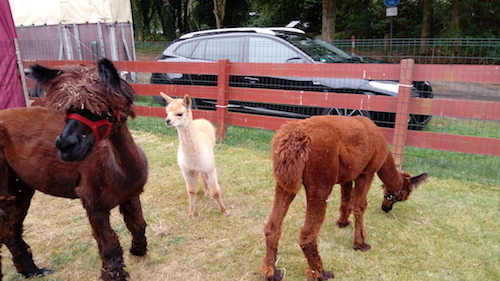 Alpacas from a nearby breeder are shown as well. Aren't they cute? 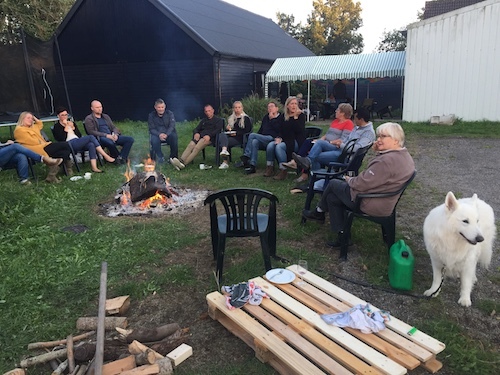 In the small village of Sebaldeburen (Northern Netherlands) our friend Ton's 50th birthday was celebrated with a surprise party. And a surprise it was! After breakfast we drove on to Utrecht for the annual meeting of the Dutch Mensa-oldies. Despite the forecast, the weather was nice and we (including Motek) could sit outside. 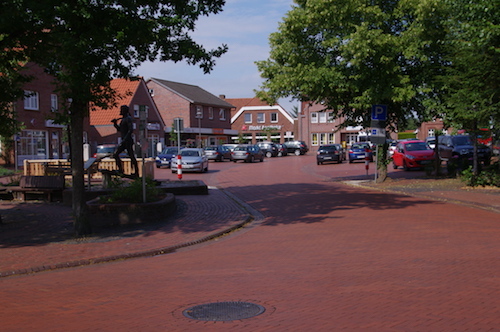 On the way back we parked for the night in the town of Enter (Eastern Netherlands). 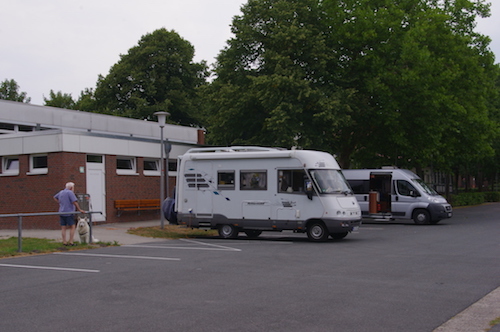 Apparently the motorhome overnight place is also the place where the whole community come to walk their dogs. So be careful where you step! 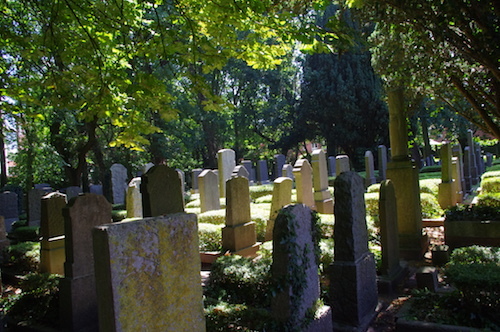 But apart from that: a nice, quiet place! 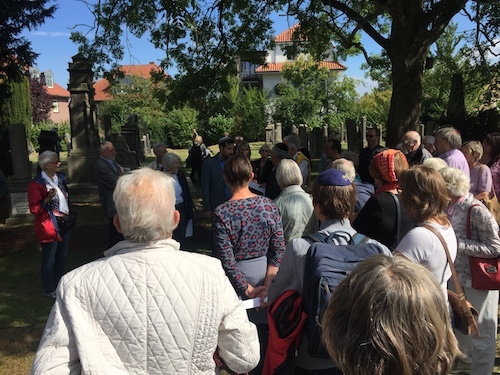 In the context of the European Heritage Day on September 9th the old Jewish cemetery in Oldenburg was open to the public. 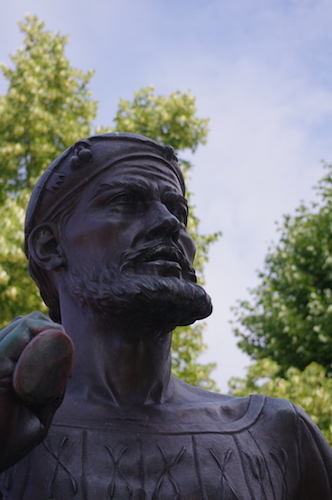 Ernst was there to keep an eye on things and answer questions. The interest was overwhelming. 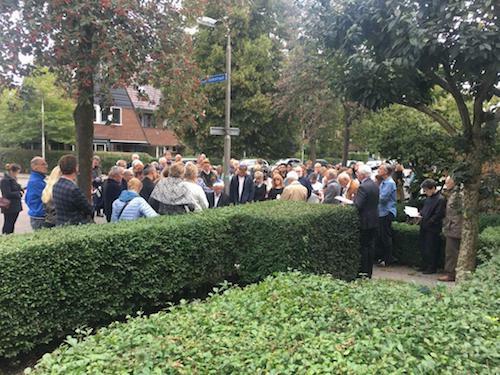 And on September 12th the Foundation Memorial Stones Amersfoort (website in Dutch) invited survivors, descendants and other people involved for the unveiling of some stones. 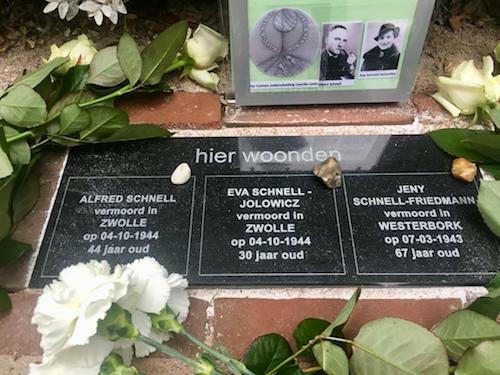 Among those were stones for Alfred Schnell, Eva Schnell-Jolowicz and Alfred's mother Jenny. 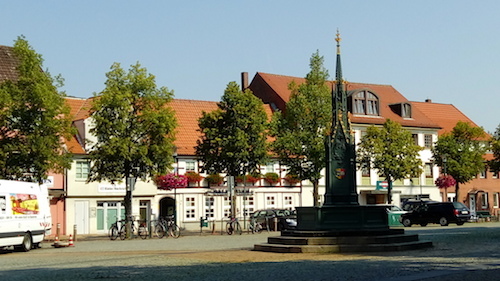 Ernst went there, as did 2½ generations Jolowicz from Germany. There has been a friendly relationship between both families since the early 1930s.